The History of Luffincott | Launceston Then! Luffincott is a civil parish in the far west of Devon, England. It forms part of the local government district of Torridge and lies about six miles south of the town of Holsworthy and 7 miles north of Launceston. Historically it formed part of Black Torrington Hundred. The parish is surrounded clockwise from the north by the parishes of Tetcott, Ashwater, St Giles on the Heath and Northcott. Its western border follows the River Tamar. The name Luffincott has a variety of early forms, first appearing in documents as Leghygnecoth′ in 1242 with variants such as Loghingecote (1285), Lughyngcote (1330), Loghynton que vocatur Loghyngecote (1346) and Luffencote (1577). Its derivation is cot (cottage or small settlement) of Luhha′s people. St James’s Church, Luffincott is a Grade I listed building. It stands near to the farmyard of Luffincott Barton, a mid-19th-century farmhouse and out-buildings which were part of the Tetcott estate. The church tower was was re-built in 1791 and the whole church itself was restored in 1893, The interior (below left) features a barel vaulted roof and a 14th century font. 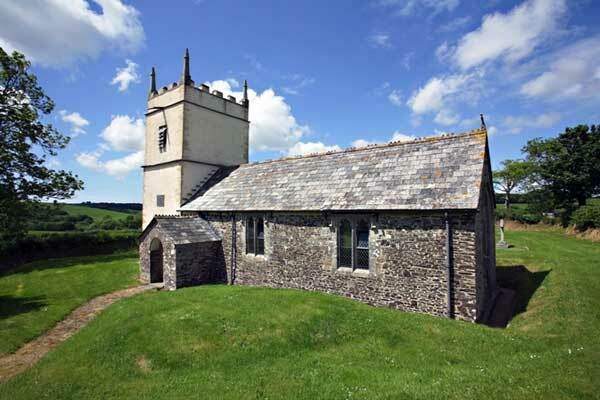 In December 1979 this church was put into the hands of the Redundant Churches Fund, now the The Churches Conservation Trust and is maintained by them as an example of rural tranquillity. During 1981-82 the main roof was strengthened and re-slated, windows repaired, new drainage installed and the tower parapet rebuilt. 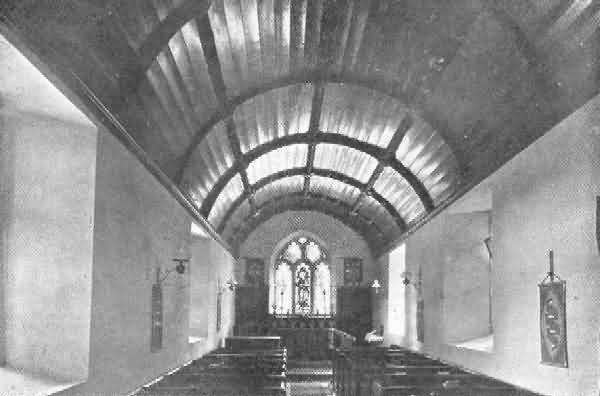 Internal replastering and limewashing was carried out during 1983. The tower was rendered and limewashed and the walls of the church repointed in 1992. Above right is Luffincott Rectory in the early 1900’s. Local historian Shawn Dymond wrote in the ‘Cornish and Devon Post’ in 2015. The Rev. Franke Parker M.A. Was rector of Luffincott for 45 years — born February 23rd, 1803 and died April 3rd, 1883. The Rectory was notorious because of a ghost which was said to hold nocturnal reign there. Shawn Dymond continued; Once a delightful residence, by 1907 the Rectory was a dilapidated ruin. Rev. Franke Parker was said to have been eccentric in his habits, those that remembered him said that there was ‘beneath his peculiarity a certain kindness of heart.’ Before his death he declared he would appear at frequent intervals in some kind of animal form, and a dog, rat, and white rabbit were mentioned as among his selections. In an attempt to frustrate his intention at reappearing, it was said that on his death in 1883 he was buried, at Luffincott, some 17 feet deep. At the turn of the century the living was presented to the Rev. Thomas Ward Brown, who at once moved in. What happened next is more or less hearsay, but it is accepted as true that Rev. Ward Brown slept in the Rectory only one or two nights before locking up the building and taking lodgings in Clawton, never returning to the house. 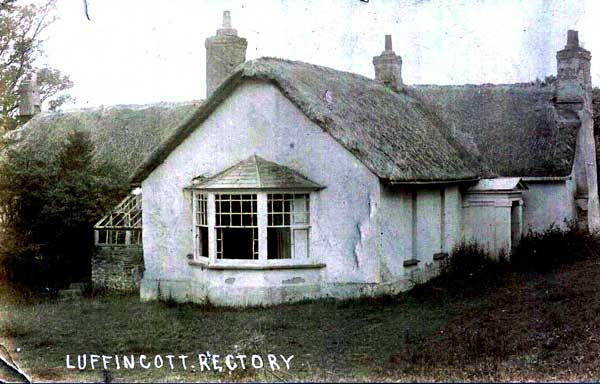 Throughout 1907 news of the ghostly presence spread beyond the confines of Luffincott and numerous parties ventured to stay the night in the old Rectory, in the hope of coming face to face with Rev. Parker — all to no avail. In March of 1911 the Rectory burnt to the ground in unknown circumstances.